Over the past few weeks, I have moved through my life with an unsettling sense of being in limbo. It makes sense, really. The beautiful, chaotic blur of grad school drew suddenly to a close, the treadmill belt beneath my feet fading to a stop and my lungs thirsty for air. Somewhere along the line, perhaps out of survival, I lost touch with the art of relaxation. I have no thesis deadline looming, no conduct conversation to plan for, no RA staff to meet and laugh with. In some ways, this has been exactly what the doctor ordered. Time with family, time to breathe, time to plan for the next big adventure. But, each morning, I’ve woken with a bit of uncertainty as to what I should be committing my time to. As a result, I’ve been taking care of a few commitments that lost priority to the grad school grind. I finally got around to watching the fourth season of Arrested Development (which, despite the warnings, was ridiculously funny), and I’ve also reconnected with the Walker family from Brothers & Sisters. I’ve been pushing myself to get outside and run, my legs losing a little reluctance each day. And, yes, I have coached myself repeatedly on the free time I’ll be begging for in a few months’ time. 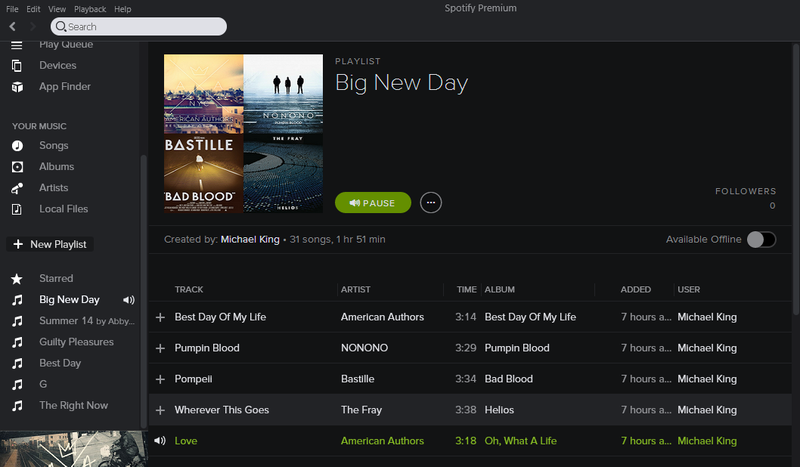 Skip forward to today, the birthdate of “Big New Day.” At 31 songs, it is currently less than 2 hours long and – if I do say so myself – decidedly positive in tone. Not every song is exactly up-tempo, but the recurring theme seems to be that life is waiting to be lived. And, go figure, it’s time to live it (throwback to my first blog entry, which called on the Imagine Dragons’ idea of the “time to begin”). Today, I decided to make the most of the day at hand. I helped my younger sister find coconut oil for her hair, used the scone mix we’ve had in the pantry, and printed out an application for a new social security card. I’m going to hug my family members, going to laugh and swim with my niece, going to live this transition to the fullest, because – whether we see it as such or not – it counts just as much as any other stretch of life. Final thought: If you don’t like where your life is, get moving. As far as I can tell, that is the shockingly simple answer to most of the angst we’ve invented. Take advantage of the big new day. Go live.